. It did not slight details, but they were an integrated, organic part of a performance." "The Thorens TD 2010 played music with great exuberance, moving it forward with unwavering momentum." Features "Uses a 9.8-pound platter machined from aluminum, with a layer of damping material underneath." "The plinth is a one-inch thick slab of acrylic, a very inert material." "There is no suspension of the plinth or platter." "The TP 250 tonearm, an OEM version of the popular Rega RB250, is installed on the 'table in a mount that enables VTA adjustment."
. The distributor was right. Everything went right into place with no adjustments needed." Value "To get substantially better performance, I suspect youd need to lay out substantially more money." One of my first manual turntables was a Thorens, the TD 125, on which I mounted a Rabco straight-line-tracking tonearm. The 'arm was a challenge, but the turntable never gave me a moments trouble. It looked elegant, ran silently, and turned at the right speed (it was adjustable, however). And it got great reviews, which was important to me at that time. But like so many companies, Thorens seemed to disappear from the American scene along with the LP. Therefore, I was pleased to learn that Thorens has a new line of turntables available in the US, and I was eager to hear how they compare to other modern-day turntables as well as their earlier incarnations. The new Thorens line of turntables includes several conventional-looking models, but the top-of-the-line models, the TD 2010 and TD 2030, are more contemporary designs. Both are works of art, sporting acrylic plinths and beautifully polished aluminum parts. An innovative dust cover is perfectly designed for keeping dust off the platter and tonearm. 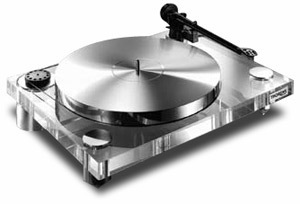 The $2499 USD TD 2010 uses a 9.8-pound platter machined from aluminum, with a layer of damping material underneath. The bearing is mounted on a shaft that extends 1" beneath the platter. A hemispherical bearing is machined into the bottom of the shaft, and the thrust plate is at the bottom of a well that is mounted into the plinth. All you have to do to install the platter is line up the shaft over the well and lower it slowly into place. You dont have to add any oil, but you can if you want to. An included felt mat is placed on top of the platter; the review sample of the mat had the center hole punched off-center, so the mat stuck out from under the LP on one side. I doubt that this caused any operational degradation, however. The plinth is a one-inch thick slab of acrylic, a very inert material. It looks like crystal, clear and shiny. Three polished-aluminum cylinders terminated in sharply pointed cones support the plinth. The TP 250 tonearm, an OEM version of the popular Rega RB250, is installed on the 'table in a mount that enables VTA adjustment. The 'arm was terminated with the usual Rega cables, which look like they are from one of Radio Shacks budget lines. There is no grounding wire to connect to a preamp. The motor is in a separate package, mounted in a polished aluminum cylinder and topped with a plastic pulley. The motor assembly sits in a circular hole in the plinth, but doesnt touch it. I prefer such an arrangement over those that place a detached motor some distance from the platter; it looks better and affords the motor some protection from being accidentally bumped or moved. Rubber feet under the motor keep it from sliding around and provide some vibration isolation. A thin rubber belt that felt like it had a square cross section connected the motor and the platter. The motor was dead silent, even when I placed my ear right next to it. The aluminum feet under the plinth provide a sturdy support, but I was unable to adjust them to level the unit, even though the manual said it was possible. Fortunately, my rack shelf is level. You should be sure your shelf is level, or use an adjustable base with the TD 2010. There is no suspension of the plinth or platter; they are rigidly coupled to the supporting table underneath. However, when I tapped the supporting table and then the plinth (gently, of course), the transient from the 'table was noticeably quieter than the one from the plinth, so the acrylic plinth is obviously damping out some of the sonic feed-through. A control box with two switches regulates operation of the TD 2010. The left switch turns the turntable on and off, while the right switch sets speed at 33 1/3 or 45 rpm. There was no fine adjustment for either speed, but according to my Rek-O-Kut strobe disk, the speed was correct. A separate transformer provided correct voltage to the control box. That makes for a lot of boxes you have to place in setting up this turntable. The Thorens TP 250 tonearm is straightforward. Although Rega disdains VTA adjustments, Thorens adds a VTA adjuster in the form of a collar around the base of the tonearm. You loosen the collar, and move the 'arm up or down, then retighten the collar. There are more elegant ways to add VTA adjustment to a Rega tonearm, such as the several after-market rotating mounting sleeves. However, at least Thorens gives you a coarse adjustment. Antiskating force is set by a slider in the tonearm-support structure. The TD 2010 arrived without a user manual (one arrived later), but the distributor told me it really didnt need one, because it was simple to set up. Normally, I view such statements with extreme skepticism bordering on panic, but I have to admit that the distributor was right. Everything went right into place with no adjustments needed. After breaking in the tonearm cable, I installed the Shure V15VxMR cartridge the distributor thoughtfully sent along. I reasoned that if the distributor regards the cartridge highly enough to send with the review unit, its probably a good complement. Since Shure has discontinued this venerable cartridge, I was anxious to hear how the ultimate version sounded before it vanished into oblivion. Several critics had pronounced the cartridge to be OK, but implied that it was not worthy of a real audiophile system. I wanted to form my own opinion (which is that the cartridge is pretty doggone good!). I also used this cartridge with my reference Linn LP-12 turntable and Graham 2.2 tonearm to establish a baseline of performance and ensure that I could make valid observations about the Thorens TD 2010 on its own. Tracking force is set by moving the arms counterweight back and forth until the desired force is achieved. The TP 250 lacks a tracking-force dial like the TP 300 arm has, and Thorens doesnt provide a stylus force gauge to set up the arm. A $25 Shure SFG-2 tracking-force gauge could be included for the $2500 price of the TD 2010, or its owner could certainly buy one. A couple of in-use issues. When I plugged the tonearm cable into the moving-magnet phono section my of Audio Note M2 Phono Signature preamp, the lack of a grounding wire wasnt a problem; but with a Bel Canto PRe2P preamp in for review, there was a slight hum when I touched the 'arm. A record clamp can assure good contact between the LP and the platter/mat, and while Thorens makes such a clamp, one was not included with the TD 2010. The TD 2010s spindle was so tall that my KAB rubber clamp wouldnt seat properly, but the other clamps in my collection, which had spindle holes that went completely through the clamp, worked just fine. My first impression of the TD 2010 was of its exemplary pace, rhythm, and timing (PRAT), which propelled musical performances along with great momentum. The PRAT factor was so strong, I suspected that the TD 2010 might actually be running a bit fast; however, a strobe disk showed that the speed was exactly 33 1/3. On hard-driving music like the title cut from the venerable Thelma Houston and Pressure Cooker's Ive Got the Music in Me [Sheffield Lab Lab-2], the effect was exhilarating. My second impression of the TD 2010 was of its smoothness. It painted a musical performance with a broad brush, revealing the architectural outlines of a work. It did not slight details, but they were an integrated, organic part of a performance. In other words, details did not jump out at me, which can happen when there are peaks in the frequency response. On a realistically recorded LP such as Eva Cassidys Songbird [S&P Records S&P-501] vocals were exquisitely smooth, instruments were realistic, and the passion of Cassidy's singing came through undiminished. The TD 2010 produced deep bass, extended but not peaky highs, and a midrange that extracted plenty of information from LPs. Dynamics were quite good, if not state of the art, and vocal and instrumental timbres were realistic. The harmonic structure of instruments was well fleshed out. Strings were appropriately lush, or if the music called for it, strident. Lower strings not only had appropriate weight, but also tonal accuracy. Wind instruments were also tonally accurate, to the extent the recording permitted. On orchestral works like de Fallas "Interlude and Dance," from Classic Records 45-rpm pressing of Fritz Reiner and the Chicago Symphony Orchestras Spain [LSC-2230], dynamics were huge and uniform across the frequency spectrum, even in the bass. Strings were massive and lush, and accurately localized in the soundfield. The unmistakable transients of the castanets were clearly defined and located towards the left rear of the stage. Soundstaging was realistic, though not exaggerated, and instruments and vocalists were arrayed in believable locations. In short, this piece sounded great. The Shure V15VxMR cartridge is heralded for its tracking ability, and at the end of the TP 250 'arm, it never mistracked on even the heaviest passages at its recommended 1-gram tracking force. It just sailed blithely along, producing smooth, detailed music. I couldnt resist confronting it with the all-time tracking challenge, Telarcs 1812 Overture (Erich Kunzel conducting the Cincinnati Symphony Orchestra [Telarc DG-10041]). This recording has a huge bass transient that requires the cartridge to negotiate a high-amplitude groove that makes what looks like a 90-degree turn. No cartridge in my experience has completely succeeded in tracking this section. The Shure V15VxMR with the TD 2010 tracked it as well as any cartridge Ive tried, and far better than most. Tracking is not the only important parameter in cartridge performance, but if the stylus loses contact with the groove, the outcome cant possibly sound good. Amplifiers  Art Audio PX 25 stereo amp, Wright Sound Company WPA3.5 monoblocks. 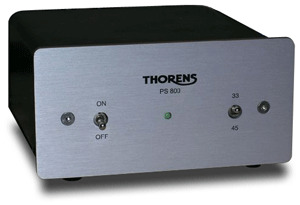 Preamplifier  Audio Note M2 Phono Signature preamp and Audio Note AN-S3 step-up transformer. Digital  Meridian 508.24 CD player, HHB CDR-850 Professional CD recorder. Analog  Linn LP-12 turntable, Graham 2.2 tonearm, Dynavector DRT XV-1 cartridge. Interconnects  Purist Audio Design Venustas, Blue Marble Audio, DNM with Eichmann Bullet Plug RCAs. Speaker cables  Purist Audio Design Venustas. Power cords  Blue Marble Audio, Silver Circle Audio. While the TD 2010 is a fine turntable in it own right, it could also form the basis for upgrades. Inveterate tinkerer that I am, I would be tempted to experiment with improving or replacing the tonearm. The TP 250 worked well, but more upscale tonearms (including the Thorens TP 300 or its Rega equivalent, the more upscale Rega 'arms, the Graham Robin, or the VPI JMW-9) might provide even better performance. Alternately, there are lots of modifications available to improve the Rega RB250 'arm sonically and mechanically. Trian, the US distributor, informed me that Thorens is now offering the TD 2010 with SME tonearms, which should do full justice to the superb 'tables performance, albeit at a substantial price increase. My reference Linn LP12 turntable with its Graham 2.2 tonearm costs much more than the TD 2010 -- approximately $8480, over three times the price of the TD 2010. Therefore, the Linn/Graham combo had better outperform the TD 2010, which it did, although not by a huge margin. It certainly wasnt three times better! A slight high-frequency softening that the TD 2010 imposed was not noticeable with the Linn/Graham setup, which made the frequency balance of LPs sound more like that of equivalent CDs. No, it didnt make LPs sound like CDs, but the frequency balance was much closer to that of CDs, and, I believe, more accurate. Microdynamics with the Linn/Graham combo were better defined, making music sound more nuanced and expressive. Bass went just as deep with the TD 2010, but on the Linn/Graham combination, it had a bit more detail and slam. Instrumental timbres with the Linn/Graham combination were more natural, and musical details were easier to discern. Alas, surface noise with the Linn/Graham combination was slightly increased. These differences were not huge, but they were discernible. For example, on the Linn/Graham combination, Eva Cassidys "Autumn Leaves" sounded more expressive and detailed, and her acoustic guitar was easier to separate spatially from other instruments. The Thorens TD 2010 played music with great exuberance, moving it forward with unwavering momentum. Music seemed to swagger out of the grooves and into the room. Although the TD 2010 sounded good on all types of music, it seemed to me that it would be particularly good with energetic rock. The turntable is spookily quiet, spins at the exact speed, and is easy to set up. The tonearm is probably as easy as others in this price range to set up, and allowed the cartridge to perform very close to its best. To get substantially better performance, I suspect youd need to lay out substantially more money. Not only was the TD 2010 an excellent performer, it was also drop-dead gorgeous. The combination of the acrylic plinth and the polished aluminum platter, feet, and motor housing were striking and would grace the most sophisticated-looking audio system. Highly recommended. Bravo, Thorens, on your auspicious return to turntable production.